York River Bloom View of algal bloom on August 5, 2016 looking southwest toward Yorktown Naval Weapons Station. © W. Vogelbein/VIMS. Mainstem Bloom Patches Massive bloom patches are visible on September 12, 2016 looking westward from Virginia's bayside Eastern Shore. Bloom bands were evident nearshore all the way south to Cape Charles. © W. Vogelbein/VIMS. Algal blooms, which peak in lower Chesapeake Bay in mid- to late summer each year, are notoriously challenging to study. A partnership between William & Mary’s Virginia Institute of Marine Science and both NASA and NOAA is now addressing that challenge, using the latest in satellite technology to better track where the rapidly shifting blooms might be on a given day. “Satellite images really help direct our sampling efforts,” says VIMS professor Kimberly Reece. “Otherwise, you can chase your tail around trying to figure out what’s going on where.” With reports of this year’s Bay blooms ranging from near the Maryland border to Cape Charles on Virginia’s Eastern Shore, any help in pinpointing their location can be of great benefit. In addition to their fluidity—algal blooms tend to occur in patches and tendrils that shift with tides, winds, and currents—they also challenge researchers with their changing mix of algal species. Only some of these—and only under certain conditions—produce the toxins that can transform an otherwise benign aggregation into what scientists call a harmful algal bloom or HAB. 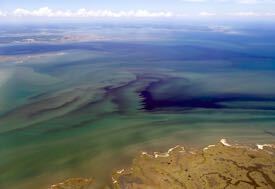 HAB toxins can harm both marine organisms and human health. After years of relying on water-level sightings of Bay algae—the most common local species stain the water a rusty red—scientists at VIMS have in recent years been lifting their gaze, first using aerial photography and now reaching even higher to get a space-based view of bloom events. The NASA collaboration began last summer, when the DEVELOP Program, headquartered at NASA Langley, partnered with Reece, fellow VIMS professor Wolfgang Vogelbein, colleagues at Old Dominion University, and officials in Virginia’s Department of Environmental Quality and Office of the Secretary of Natural Resources. In summer 2015, program participants explored how data from U.S. satellites could be used to help monitor HABs in real-time, document associated water-quality conditions, and predict future blooms. They initially focused on data from NASA’s Aqua and Terra satellites, which sample Chesapeake Bay on a daily basis and in wavelengths that capture the chlorophyll signature used to identify algal growth. They also examined data from Landsat, a satellite developed, launched, and operated by NASA and the U.S. Geological Survey. Landsat doesn’t sample the wavelengths ideal for detecting algae in coastal waters, and only passes over the Bay every 16 days. But it can yield indications of algal blooms, and offers data of greater resolution, with 250-meter pixels compared to 1-kilometer pixels for the MODIS sensor on the Aqua and Terra satellites. But the real breakthrough in the NASA project came from an unexpected direction, when toward the end of the summer a team from NASA Goddard flew an airplane equipped with a “hyperspectral” sensor over the lower Bay. As the name implies, this sensor records wavelengths at very fine intervals across the entire electromagnetic spectrum, from infrared through visible light to ultraviolet. Says Ross, “We happened to get hyperspectral imagery from the lower York River during a dense Alexandrium bloom, and we saw a big response, a strong peak in the region from 705-710 nanometers.” Alexandrium monilatum is one of the two main species of algae implicated in recent Bay blooms, and is known to release toxins harmful to other marine life, particularly larval shellfish and finfish. Ross says that discovery of this spectral peak was “an insight that we were just beginning to understand as the 2015 project was wrapping up.” But fast forward to this year—when Ross saw aerial photos of another Alexandrium bloom that Vogelbein had shared with project partners—and a light bulb went off in his head. That sensor flies aboard the Sentinel-2a satellite launched in June 2015 by the European Space Agency. Ross says, “It just happens to sample in the specific set of 700-nanometer wavelengths that our work last year had shown was really important for seeing chlorophyll in water.” The sensor also samples in very high-resolution, with image pixels as small as 10-meters square. The MODIS sensor—with its coarser, 1-kilometer resolution—remains a mainstay for the Bay’s open waters, as the advantage of its daily return interval outweighs its lack of detailed imagery. 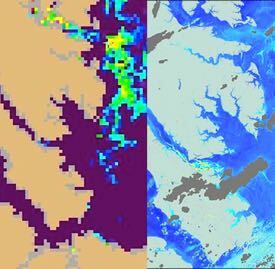 Although use of Sentinel imagery already portends better monitoring and prediction of algal blooms in the Chesapeake and other coastal waters, the researchers believe the future holds even greater promise. For instance, a current drawback of the Sentinel-2a is its lengthy return time of 10 days. But, says Ross, the planned launched of a sister satellite could halve that to every 4 to 5 days. The launch of Sentinel-2b is scheduled for 2017. One advance that Reece would particularly like to see is a sensor with the capability to identify and distinguish between different algal species. “We’d really like to be able to distinguish blooms of Cochlodinium from blooms of Alexandrium,” she says, “so we could see when it’s doing that transition.” In recent years, algal activity in lower Chesapeake Bay has typically begun with a bloom of Cochlodinium polykrikoides in mid- to late-July, followed 2-3 weeks later by blooms dominated by A. monilatum. Ross says “Species differentiation is a future research project that will take more work,” and seems excited to continue collaborating toward that and other goals with Reece, Vogelbein, and other marine scientists.